We sell Auchtermuchty products like Scottish Organic Free range Medium Eggs - 6 (half a dozen) online in the UK and directly from our award-winning store in Scotland. If you want to automatically receive an email when 'Organic Eggs - Medium' is back in stock, just leave your email address below. Locally sourced, Scottish free range eggs from chickens who live outside and don't get preventive antibiotics. Organic eggs are better for you, for the chickens and for the planet. Eggs contain significant levels of vitamin A, B-complex vitamins, vitamin D, vitamin E, and vitamin K, as well as phosphorous, selenium, calcium, and zinc. Furthermore, eggs also have various key organic compounds, such as omega-3, antioxidants, and protein. A hearty winter dish with spelt, curly kale, carrots, eggs and veggie bacon. Spelt is an ancient grain eaten by our ancestors thousands of years ago. Some people with wheat intolerance can tolerate spelt, but beware; spelt still contains gluten! This recipe contains 4 eggs. Never knew what to do with seaweed? Try this healthy alternative to meat burgers, made with tofu and seaweed! Seasonal recipe with tomatoes and lettuce. This recipe contains 1 egg. Plums are in season in September and this pudding is a great way of using them (other than eating!). Have this pudding for dessert on its own with a cup of tea. This recipe contains 3 eggs, separated. Typically served at celebratory meals in the Southern states of America, this pie links the classic combination of pumpkin, pecan nuts and aromatic warm spices in a pastry case. Serve warm as a dessert or chilled with a cup of coffee. This recipe contains 3 egg yolks. Green soups can be nice too! British grown asparagus are only available for a very short time, so make the most of it while you can! This recipe contains 4 eggs. Typically served at celebratory meals in the Southern states of America, this pie links the classic combination of pumpkin, pecan nuts and aromatic warm spices in a pastry case. Serve warm as a dessert or chilled with a cup of coffee. This recipe contains 1 egg. A healthy pie filled with omega 3 containing seeds, fibre rich avocado and it's gluten free too! Serve it with a side salad as all salad leaves are in season right now! This recipe contains 2 eggs. Spicy vegetarian burgers with (homemade) piccalilli. This recipe contains 1 egg. Who knew you can use cauliflower to make a gluten free pizza base?? Try this recipe from A.Vogel and see for yourself. This recipe contains 1 egg, beaten. Cooking gluten free doesn't need to be more difficult as this gluten free recipe for apple pie shows. This recipe contains 1 medium egg. A vegetarian recipe, serve with potatoes and pickled vegetables or sauerkraut for a seasonal dish. This recipe contains 2 eggs. These tasty pancakes are made with gluten free oat flour and Mheat streaky rashers. Suitable for a vegetarian diet. This recipe contains 2 medium eggs. Who doesn't want chocolate on cold, January days? What's even better is that these cupcakes are dairy free and gluten free and made with low GI ingredients! This recipe contains 2 medium eggs. If you fancy adding a little bit of luxury to your breakfast or evening meal then this cream gourmet omelette is worth a try. This recipe contains 3 eggs. This is a vegetarian seasonal recipe using turnips, tofu and eggs. This recipe contains 4 medium eggs. A vegetarian soup made with seasonal ingredients. Parsnips are available from the UK in the winter months. This recipe contains 4 medium eggs. As long as you know which weed is which, you can make very healthy dishes for virtually nothing! This recipe contains 4 medium eggs. This easy-to-make omelette uses eggs and smoked salmon. Go for salmon trimmings instead of sliced, because trimmings are a lot cheaper and you don't need to cut it either! This recipe contains 4 medium eggs. We sell real Auchtermuchty and other Baking Sundries directly from our shop in Scotland and online throughout the UK. View more products from Auchtermuchty. Where can you buy real Organic Eggs - Medium safely online? If you are wondering where you can buy Scottish Organic Free range Medium Eggs - 6 (half a dozen) safely online in the UK, then shop with us. 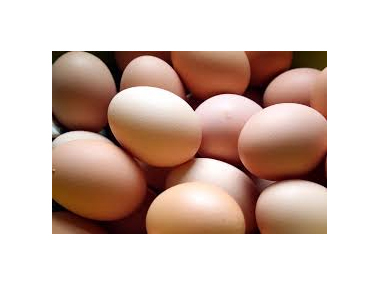 Organic Eggs - Medium - Scottish Organic Free range Medium Eggs - 6 (half a dozen) in Baking Sundries and Baking.